i don't normally blog cooking, but since it's entirely the fault of another blogger (who shall remain nameless :P) that i've been craving sweet stodgy things of late i thought i'd return the favour. 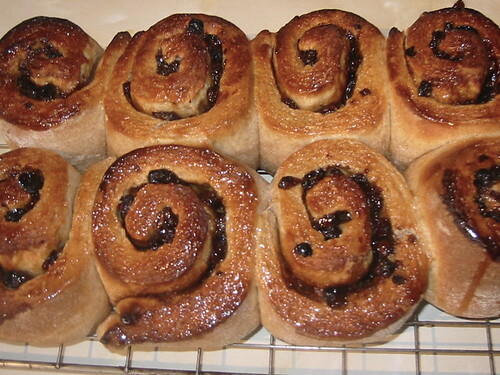 chelsea buns from sue lawrence's book of baking (slightly over-browned in the oven but also made mostly from wholemeal flour). i didn't read the recipe right through so didn't realise they'd take 3 hours for the inital rising. so plans for tea yesterday had to be shelved and instead they went in the fridge overnight, ready to be baked thismorning. so for the first time ever we had morning cake (or morning buns as M insists). does anyone - did anyone ever - really have cake every morning, like mickey? what luxury.